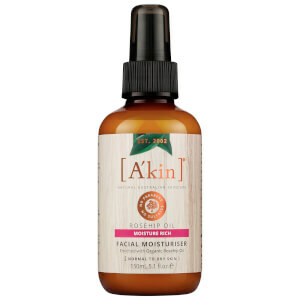 Replenish your complexion with the A'kin Rosehip Oil Facial Moisturiser; a lightweight, natural formulation that utilises certified organic oils and butters to soften and condition. Enriched with a nourishing blend of ingredients, including Rosehip Oil, Avocado Oil and Shea Butter, the non-greasy moisturiser absorbs quickly into skin to deliver intense, long-lasting hydration. 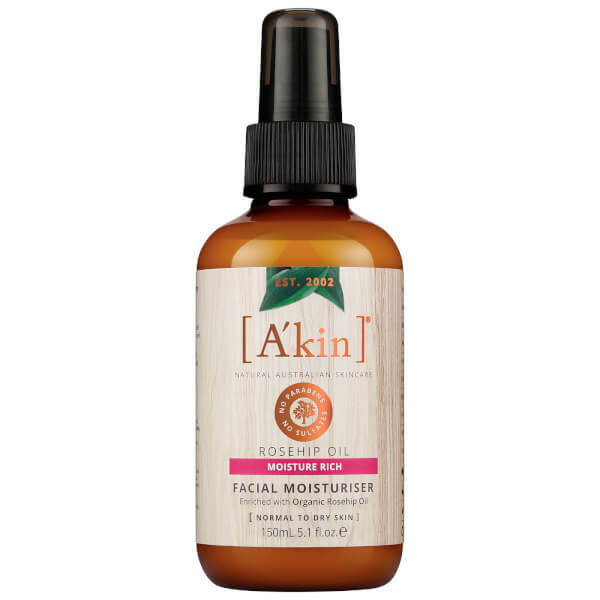 Expect a smooth, comfortable complexion that feels rejuvenated around the clock. Housed in a convenient pump bottle for mess-free application. Aloe Barbadensis Leaf Juice+, Rosa Centifolia (Rose) Flower Water, Macadamia Ternifolia Seed Oil*, Cetearyl Olivate*, Butyrospermum Parkii (Shea) Butter+, Sorbitan Olivate, Glycerin*, Rosa Canina (Rosehip) Seed Extract+#, Sorbitol*, Persea Gratissima (Avocado) Oil+, Cetearyl Alcohol*, Xanthan Gum*, Sodium Gluconate, Tocopheryl Acetate (Vit E)*, Pelargonium Graveolens (Geranium) Flower Oil, Rosmarinus Officinalis (Rosemary) Leaf Extract+, Fusanus Spicatus (Sandalwood) Wood Oil, Helianthus Annuus (Sunflower) Seed Oil*, Citric acid, Lecithin*, Phenoxyethanol, Sodium Dehydroacetate, Linalool^, Citronellol^, Geraniol^, Farnesol^.